If you are looking for a new way to use your favorite rubber stamp images, how about using them as a template for glass painting. This is so simple to do and the technique can be adapted to use with digital stamps. Instead of stamping directly onto glass, use your favorite rubber stamps as templates for tracing images onto glass for glass painting. This is a great way to get yet another use from your rubber stamps! By taking a stamped image and using it as a template for glass painting, a whole new range of creative opportunities open up. This is a good way to decorate candle holders, light catchers, jars and any other number of glass objects. This technique can be used to follow themes for parties and weddings. The stamped images that have been used on cards and table decorations could be copied onto glass candle holders. See the following pages to learn how to use rubber stamps as glass painting templates. First choose your stamp! 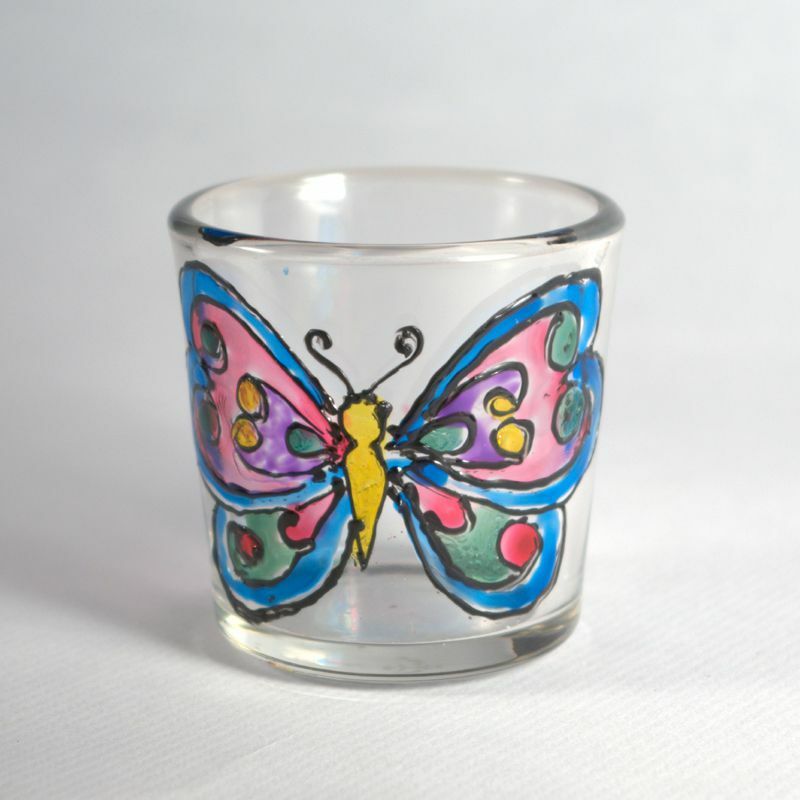 The best stamps to use are ones with strong and bold outlines which will be traced with glass relief paints. For attractive 'stained glass' effects pick stamps with lots of space for coloring with glass paints. Very ornate or complex images will not only be fiddly to work with, but also may not give a clear image on the glass. Stamp the image onto a piece of clean white paper. The type of paper and ink is unimportant and this can be a good way to use up scraps of paper or recycle paper by stamping onto the back of a piece of printed paper. Cut the paper to the right size if necessary. Ensure that the surface of the glass is clean and free from fingerprints. Clean the surface with rubbing alcohol if necessary. Take the relief glass paint and trace the outline of the stamp. Leave to one side to dry according to the manufacturers instructions. Paint the image with glass paints as required and leave to dry. When the glass paint is dry it is possible to add other embellishments to the image such as stick-on glass beads. Use old glass jars to make candle holders, this is a good way to recycle while also creating lovely unique items. Most glass paints can be blended to create a wider spectrum of colors. Use a piece of plastic or an old lid from food packaging as palette to mix colors. Check the manufacturers instructions for any special requirements. When making candle holders, place a candle into the candle holder before positioning the stamped template to get a good idea of the best place for the image. Use rubbing alcohol to completely clean the surface of the glass before starting, this will ensure that the paint adheres well to the glass. Keep any discarded stamped images from stamping projects as these could be used as glass paint templates. Keep them together in a folder for easy reference.